The NHS and independent healthcare sectors increasingly depend on the contributions of the migrant workforce to make up for serious shortfalls in staff numbers. This book analyses the motivation required for nurses to migrate, their experience of integration and the important contribution they can make in the healthcare environment. Based on quantitative and qualitative research conducted among migrant and refugee nurses, this book includes many first-hand accounts from individuals adapting to working life in the United Kingdom. It covers areas such as diversity, relationships, problems, cultural understanding and exclusion, as well as taking an overall look at migration, ethnicity and employment. Migrant Nurses is a practical handbook that provides vital information for human resources managers in the NHS and private healthcare sectors, diversity managers and mentors. It provides great insight for researchers interested in organisational behaviour, healthcare and development studies. Policy makers and shapers will find it helpful and community groups working with migrants and refugees will also find it valuable. 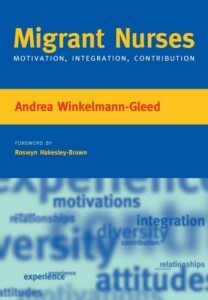 This is the first text to offer a comprehensive analysis of the motivation, integration and positive contribution that migrant nurses can make to healthcare in the UK. It offers unique insights essential for using this significant element of the healthcare workforce in an intelligent, balanced and just manner. A fascinating collection of personal stories that illuminates the larger professional and socio-political forces driving global nurse migration. In a globalized and exceedingly mobile world, the key questions raised and the challenges identified make the book important reading for our times. Winkelmann-Gleed, A. (2011) Demographic change and implications for workforce ageing in Europe – an overview. Chapter 15 in: Discrimination at Work Handbook, pp 203-118. Edited by: Wright, T. and Conley, H. Surrey, UK: Gower Publishing Ltd.
Winkelmann-Gleed, A. (2006) book chapter: How can I send money to another country? In: Working in the UK, 2nd Edition of the Newcomers Handbook, 2 nd Edition, edited by Somerville, W. Centre for Social and Economic Inclusion, London. Winkelmann-Gleed, A. and Eversley, J. (2004) Salt and stairs: a history of refugee doctors in the UK and the story of Dr Hannah Hedwig Striesow (refugee doctor and one of the first female GPs in Newham) in Jackson, N. and Carter, Y.: Refugee Doctors: Support, Development and Integration in the NHS. ISBN 1857758579, Radcliffe Medical Press, Oxford. Winkelmann-Gleed, A. (2011) Retirement or committed to work? – conceptualising prolonged labour market participation through organisational commitment. Employee Relations. ISSN: 0142-5455. Vol 34 (1), pp 80-90. Winkelmann-Gleed, A. (2011) Demographic change and implications for workforce ageing in Europe: raising awareness and improving practice. Contemporary Readings in Law and Social Justice. ISSN: 1948-9137. Vol 3 (1), pp 62-81. Winkelmann-Gleed, A. (2009) Demographic Change and its Implication for Workforce Ageing – an example of trans-European collaboration. Cuadernos de Relaciones Laborales, ISSN: 1131-8635. Vol. 27 (2), pp93-123. (Working Relations’ Notebooks), edited by the Escuela de Relaciones Laborales and published by the Universidad Complutense de Madrid’s Publications Services. Spain: Madrid. Winkelmann-Gleed, A. (2006) All together now. Teamwork should recognise and develop the diverse experiences of migrant nurses. Nursing Standard. 21 (4), pp 62-63.